Just how important is the placement of your deer stand anyway? It ranks pretty high if you are a serious hunter. Proper placement, along with matching the type of stand or blind to the terrain and shot distance, can mean the difference between a successful hunt and going home empty handed. Often, when hunting in a wooded area, your sight line may be limited to a nearby hillside or a small clearing. Choosing a location that offers the best opportunity to get a clear, steady shot, is essential. But remember, it must be in a place that remains unnoticed by migrating deer. 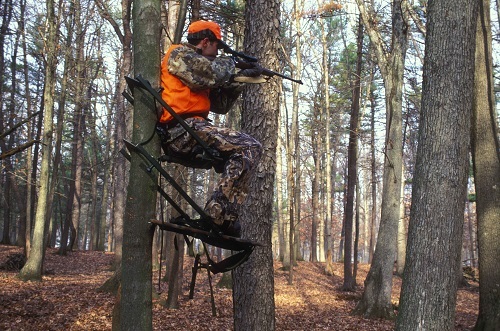 In this situation, a tree stand, where you are less apt to be seen or smelled by the deer, is a popular choice. But not just any tree will do. First, you need to get acquainted with the game travel patterns so you can choose the right tree where you can see, but not be seen. Remember, not every tree is capable of providing the steady support a tree stand requires to ensure the safety of the hunter. Look for a large, solid, mature tree. Be careful that your stand is level. If it leans downhill or is angled, you will be spending most of your time trying to stay in the tree instead of hunting, and you could actually fall out and hurt yourself. Keep all of this in mind when selecting a tree. Hunting from a box blind in standing timber can be challenging. In this scenario, your principal concern is elevation. You will need to position the blind on the side of a hill or on a ridge overlooking the area you plan to hunt. Again, the objective is to achieve optimum visibility while keeping your scent high above any game that my wander by. When hunting in a field, meadow or other opening, a tree stand may still be the best option if it is surrounded by a tree line. If you are not fond of climbing trees, a box blind could still work, especially an elevated box blind. Still, it may look out of place to a clever deer or one that frequently grazes that field. If you want to try it anyway, set up downwind from where the deer are likely headed. For a number of reasons, a permanent stand setup may not be the best idea or may simply be out of the question. Could be you are hunting the area for the first time and are not yet familiar with the travel patterns. Or maybe the landowner doesn’t want permanent stands littering his landscape. That’s when a portable or mobile stand, like the Swift Lift, becomes your best option. The Swift Lift offers many advantages, including convenience, mobility and comfort. 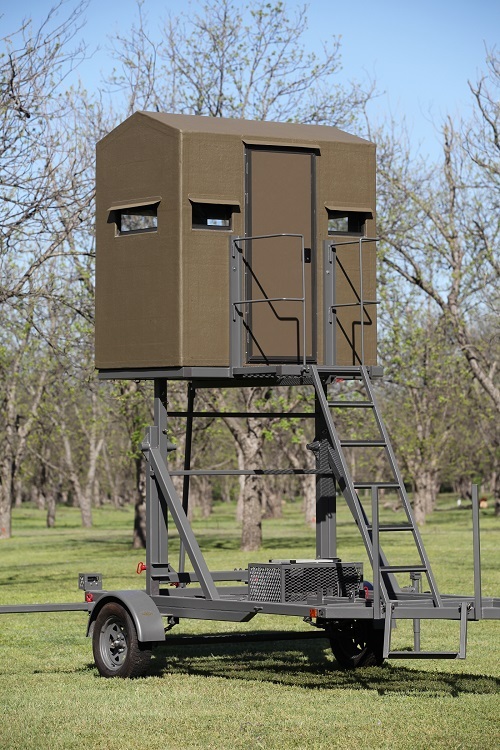 Unlike conventional stands, its greatest benefit is the fact that the Swift Lift allows you to go precisely to the spot you want to hunt. And if you change your mind, or the deer patterns change, you can easily move it to a different location. Whether you choose to hunt in a stand or in a box blind, studying the lay of the land and the travel patterns are key considerations in deciding where to place it.